The Illinois Senate has passed a bill that would provide greater protections to Illinois Bicyclists. Senate Bill 2951 has passed the Illinois Senate and is now in the Illinois House. The bill passed by a vote of 55-00-02 meaning that 55 Senators voted "Yes", none voted "No', and 2 voted "Present." With this kind of near unanimous support, the bill should have a strong chance of passing the Illinois House and hitting Governor Quinn's desk for signature and becoming law. 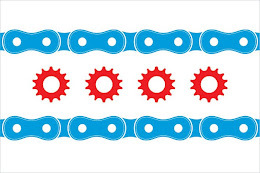 Senate Bill 2951, as amended, would amend Section 11-703 of the Illinois Vehicle Code by making it illegal for the driver of a motor vehicle to "crowd" or threaten a bicyclist by unnecessarily driving the motor vehicle close to, toward, or near a bicyclist. Provides that if a crowding or threatening a bicyclist violation results in great bodily harm or permanent disability or disfigurement to another, the person shall be guilty of a Class 4 felony. Provides that a person commits Projecting or throwing missiles at bicyclists, a Class A misdemeanor, when a person projects or throws any missile (defined as any object or substance) at or against a bicyclist. There is no way a bicyclist can win a "fight" with a motorist driving a metal box capable of driving very fast and weighing thousands of pounds. This kind of legislation is necessary to protect bicyclists as their numbers increase and forces drivers to remember to "Share the Road." The Chicago Reader linked to this blog post in an article you can find by clicking here.